Snakes are scary. Planes are scary. Therefore, snakes + plane = double scary. Right? The premise sounds like simple genius. The movie, however, is just simplistic. The content of the film does stay true to the title Snakes on a Plane. You get just what you sign up for. The overarching plot is not really important to the experience of the movie, so I won’t get into that. Just know that it’s Samuel L. Jackson trying to save the day on a plane practically bombed with, as he puts it, “snakes on crack.” Yeah, I know: How can you go wrong with that premise? The movie ends up doing what would seem impossible for a snake + plane flick: it takes itself seriously. The movie works by waiting and waiting, throwing in a few laughs, then building tension for a couple minutes, and finally releasing an onslaught of slithery pandemonium. I said that the film stays true to the content of the title, but it is in only the beginning moments that it also stays true to the hokey tone of that title. A snake bites the naked breast of a woman joining the mile-high club, two dead bodies fall on a germophobe, and a boa emerges sporting about as many teeth as a great white. These scenes are stupid, silly, and loads of fun, but they don’t last. The film quickly becomes an action-thriller. As such, it treats the snake flood as a legitimate threat instead an awesomely phony situation, and the movie stops working. The characters have been built up very little, so we don’t particularly care when they are killed, and the few that have been given a relative amount of depth are so central to the plot that they have to live, and we realize that. With the combination of the snakes on board and the awful thunderstorm outside, the possibility is presented that, aside from being killed by the snakes, the passengers could die simply from the plane going down in the middle of the ocean. A lot of weight is put on this supposedly tense situation, but we know the plane won’t go down because what kind of ending would that be? There are numerous threats to the characters in the film, but there is no true threat to the viewer in the seat. I’m sure people will say that I’m being too hard on a film whose low aims are made clear in its title. The problem is that the expected gimmickiness is hardly used. The film tries to become genuinely suspenseful. With the title it has, I’m not sure that was ever possible, but it doesn’t do a good job of it anyway. In The Birds, Alfred Hitchcock took a typically harmless, even friendly, animal, put it in a serene environment, and made a film that petrifies you with suspense and claustrophobia. 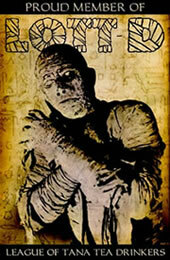 He could do this because he was a good celluloid storyteller. 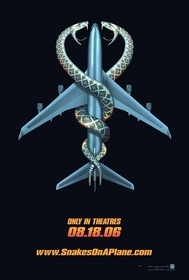 Snakes on a Plane, on the other hand, takes a scary animal, puts it in an already scary environment, and comes out with forgettable popcorn fare. I’m not suggesting all directors try to be the next Hitchcock, but invaluable filmmaking lessons could, and should, be learned from his work. Take the time to build fully realized characters. Then we might start caring. Otherwise, stick to gleeful camp. Submitted by Kevin (not verified) on Mon, 2010-05-03 19:26. Robert, your review is on target for the most part. 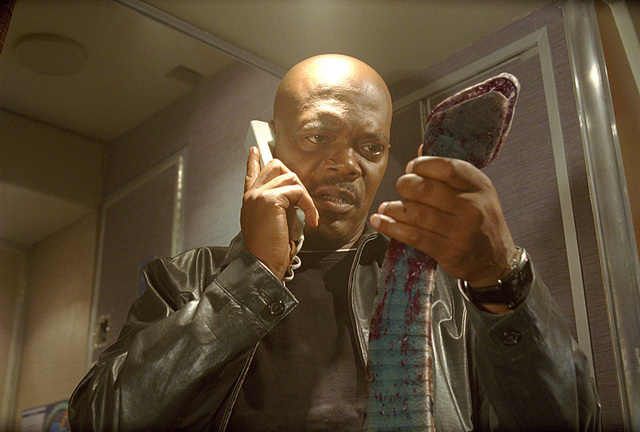 I did modestly enjoy "Snakes on a Plane", mostly for the few campy scenes you mention that occur early on in the film and for the lone performance, by Sam Jackson, that seems to fit with a camp film. His character has to be serious for the film to work even in fits and starts as it does. Jackson's own admission, during press junket interviews for the film, was that he felt he had to play it straight for the rest of the film to work at all. It seems the director just didn't have a clue as to how to do tongue-in-cheek. You make excellent points about this. Submitted by Robert Ring on Mon, 2010-05-03 20:09. Thanks, Kevin. I was really expecting this to be a fun movie when I saw it. I think the filmmakers sort of got themselves stuck in convention and hoped that their gimmicky premise could carry them through the movie. What they needed to have done, I feel, was inject that gimmickiness consistently throughout the whole thing.